In the midst of my work with the provincial election in May-June, I was able to complete an article that I had been working on in draft form for some time. I actually was beginning to feel guilty at how long it was taking me; publishing the story of this original old and distinguished house I felt was important, especially as it has been threatened for redevelopment on a few occasions recently. The house, at 408 Tweedsmuir Avenue, is tucked behind the Circle K gas station (aka Mac's, aka Winks) at the corner of Richmond. It's well hidden, to the point where likely few people even know it exists. 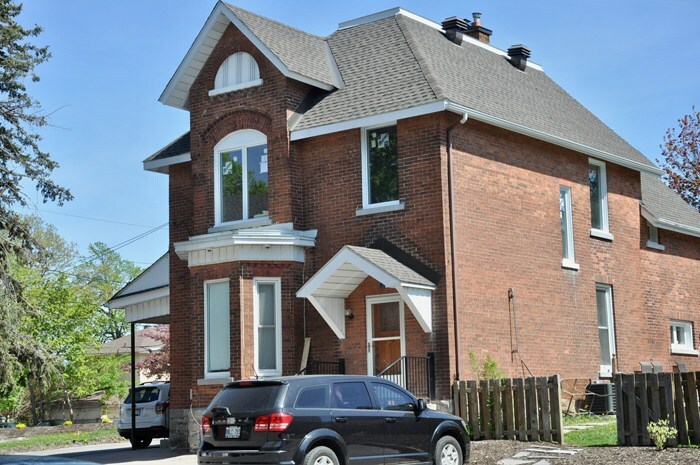 The entire neighbourhood has built around it, ever since cattle dealer James Magee constructed the farm house in 1891. At one time it stood in the open wilderness of old Richmond Road. 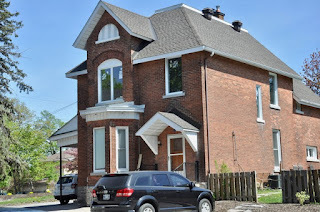 Please click this link to read more about this great old house, one of Westboro's oldest, and to learn more about the surrounding neighbourhood which Magee established, which was once called "Springdale Park". 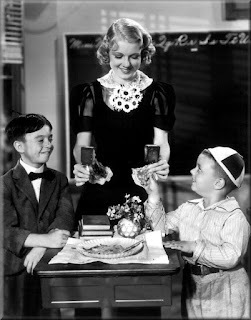 The new issue of Kitchissippi Times is out, and my column this month covers the impressive "Cinderella story" of Rosina Lawrence, a girl who grew up in Westboro and went on to briefly become one of Hollywood's most promising stars in the 1930s. 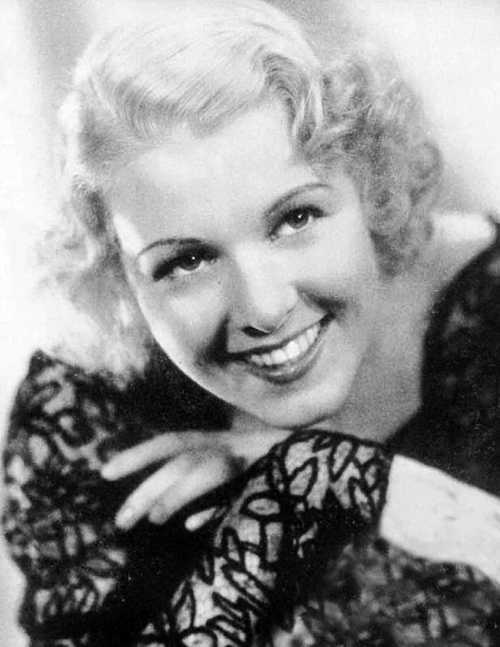 Rosina was the daughter of a Hollywood movie set builder (who honed his skills building houses in Westboro), who became a prolific dancer as a result of an unorthodox recovery method suggested by a doctor when she became partially paralyzed as a young teen. At one time she was mentioned in the same breath as Rita Hayworth as a promising star of Hollywood. Long-time Westboro historian Shirley Shorter interviewed Rosina's aunts in 1978, and her notes and quotes were the inspiration behind this article. I've been away from all things history for the last seven weeks to concentrate on the provincial election, but I am definitely looking forward to getting back in to a few projects which I had put on hold, or have popped up over May and June! 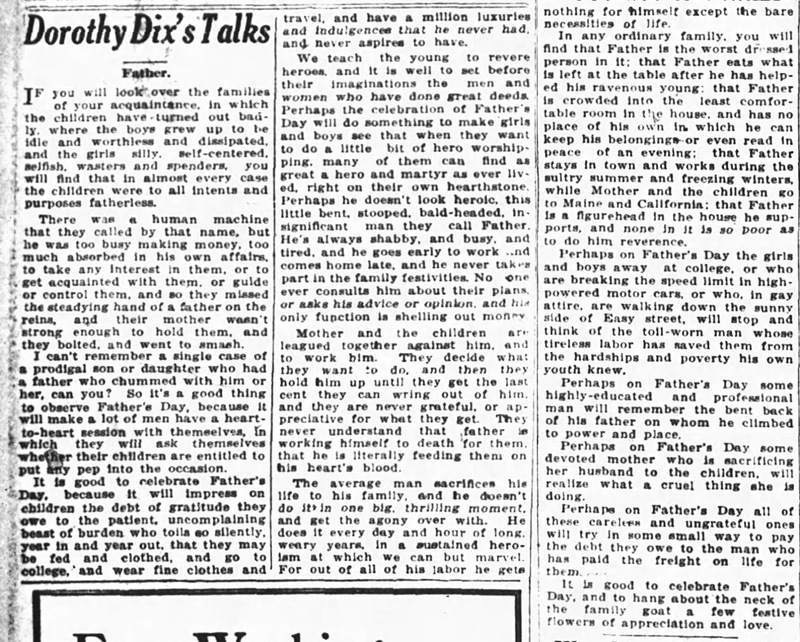 One quick topic that I thought I'd cover tonight, is the concept of Father's Day, and how it got its start, how quickly was it adopted here in Ottawa, and how long did it take to become commercialized? Wikipedia is an easy place to start, and it has the thorough history of the day's origins https://en.wikipedia.org/wiki/Father%27s_Day. 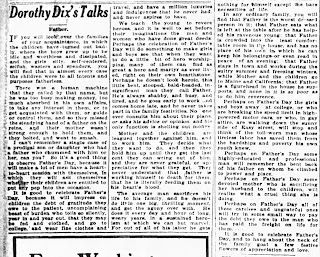 In short, it has its earliest beginnings in Catholicism, but in the U.S. did not really emerge with any traction until 1910, coming partially in response to the then-established Mother's Day holiday, and again with a more religious slant, where Churches were focusing their sermon on the third Sunday of June to honour fathers. 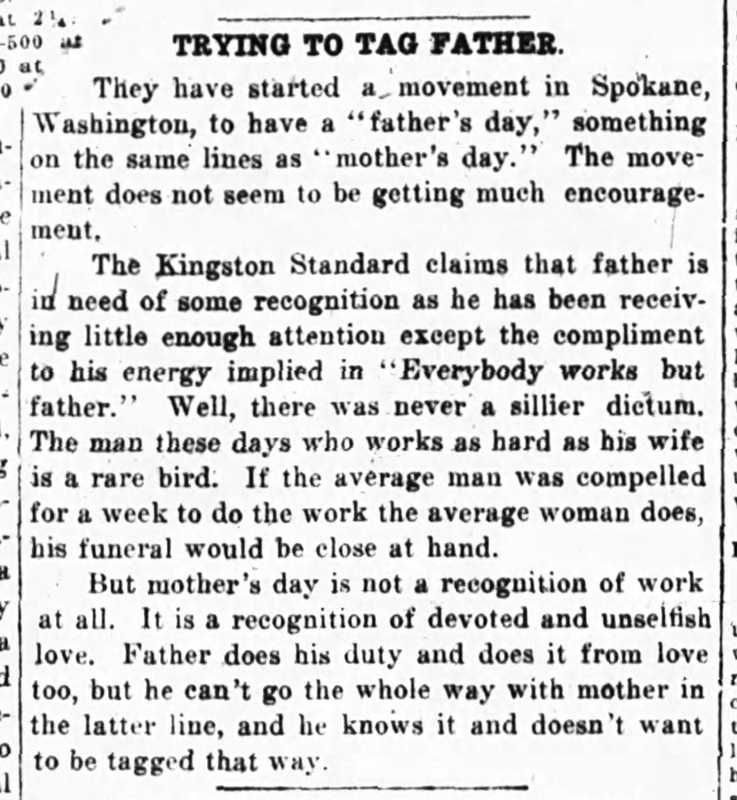 Sonora Smart Dodd is credited as the first to push the creation of a Father's Day, in memory of her father who raised her and her five siblings as a single parent. 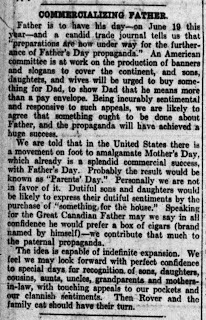 Within a few years, President Woodrow Wilson had pushed for Father's Day to become a federal holiday, but Congress was hesitant. 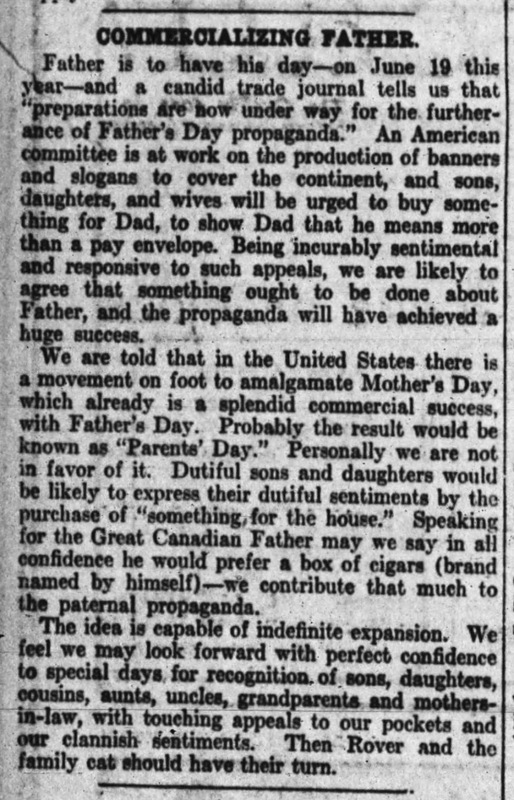 Father's Day seemingly never actually became 'official' until the late 1960s, but was driven from the 1920s onwards, as you might expect, by commercial interests. 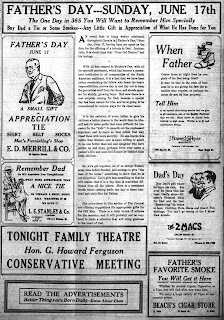 However it is June of 1923 where Father's Day first arrives in Ottawa. The event was pushed by the Rotary Club, who held a luncheon at the Chateau Laurier on June 18th honoring fathers. The guest of honour was Dr. J. H. Putman, who played a prominent role in Ottawa education circles, but was also father of nine, and a humorous speech on the topic of "Father" was given by Ainslie W. Greene. Greene joked at that luncheon that while researching material for his address, he consulted dictionaries where immediately preceding father was the definition of "fathead", but also that he had considerable trouble finding a resource which gave true tribute to fathers; that in the Middle Ages "a father was frequently recorded as being brutal and a drunkard", and in more modern times "little or nothing was being said for father". In fact Greene was dismayed that he had to turn to the writings of Homer, of the ancient Greek period for positive writings on fatherhood. 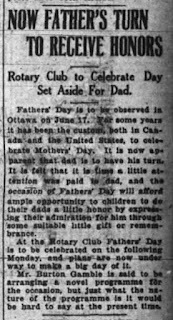 The Rotary Club's proclamation essentially birthed Father's Day in Ottawa, and of course merchants did not delay in taking advantage. 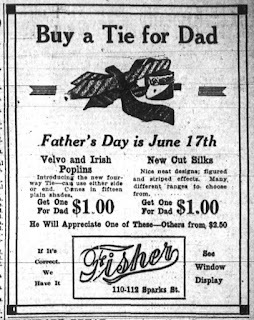 To answer the question I started this article off with - how long did it take for Father's Day to become commercialized? It took four days! the first ever Father's Day ad run in Ottawa! 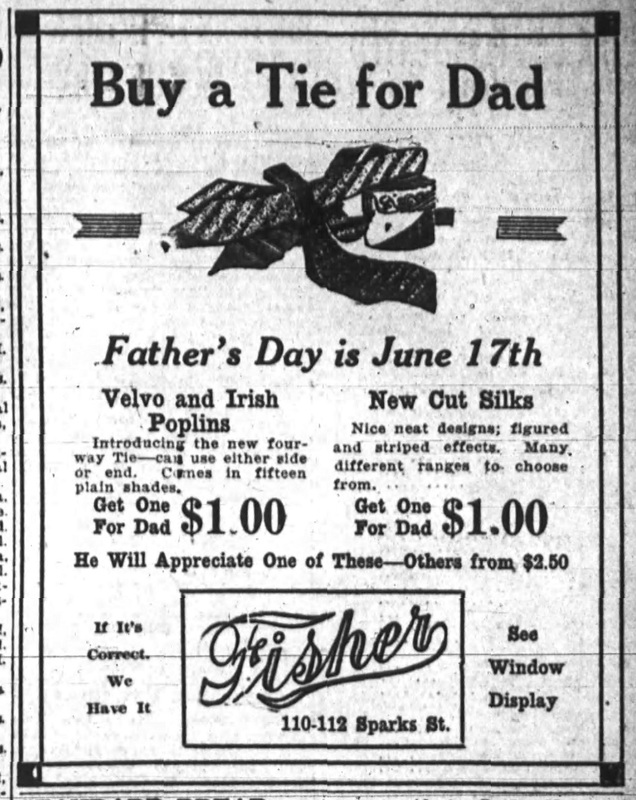 Two days after that, the Journal seized the marketing opportunity and basically ran a nearly-full page ad with several participating businesses, promoting this new "Father's Day" and all the ways you can show your Dad how you appreciate it - through ties, a belt, shoes or a cigar! 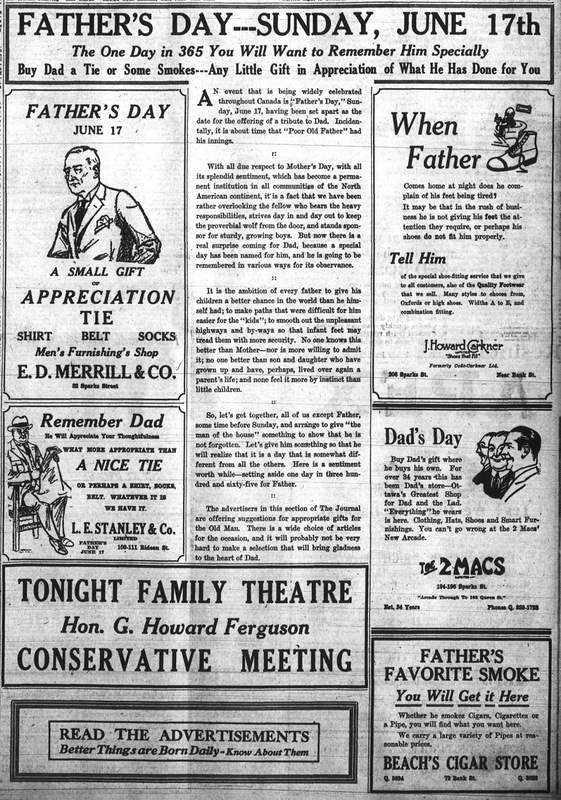 The following four or five years saw the media taking swipes at the obvious commercialism of Father's Day, and it seemed for a while the idea may die off, but despite the skepticism and the deserved mocking of the whole idea of buying-your-father-a-tie-to-show-him-how-much-you-appreciate-him, the powers of big business proved too strong, and Father's Day was here to stay. 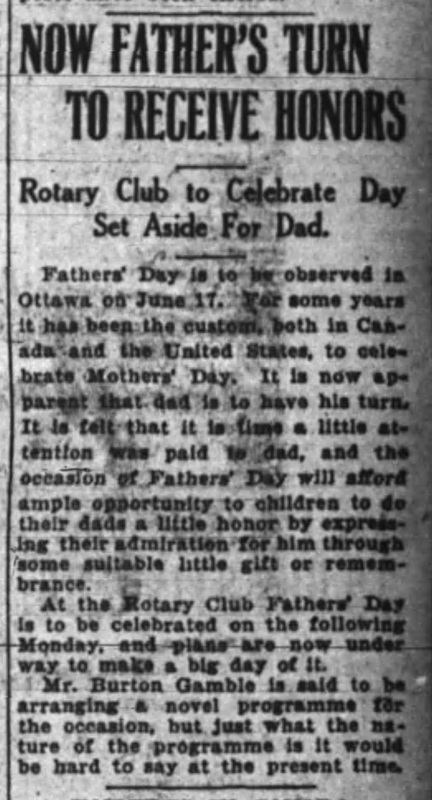 So here we are, 95 years after Ottawa's Rotary Club brought Father's Day to our city. 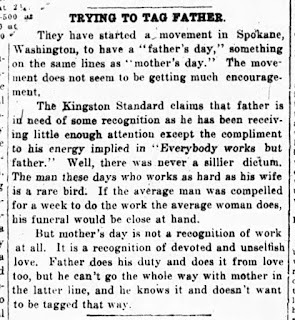 Personally, I like the idea of acknowledging the original spirit of Father's Day in using the day to commemorate those fathers who have left us. Maybe I'm a little biased though, as sadly I happen to part of that group as I lost my amazing Dad seven years ago at the far-too-young age of 61. Either way, for all of you who have lost your Dad or are fortunate to still have him with you, or if you are a Dad or a Dad-to-be, I wish you all a great Father's Day here in this great City of Ottawa.